Could Ford Motor Co. be harboring an Anglophile cell that's infiltrating its design studios and turning its products into British car clones? Mmmm. There is some evidence of this. Earlier in the millennium, when Ford still owned Aston Martin, it purloined that legendary sports car's iconic grille and placed it on the likes of the Ford Fusion. More recently, there is the new grille on the reworked 2017 Lincoln MKZ. You can argue that facial expression was borrowed from the current Lincoln Continental. But you can also make the case that both grilles evoke those of contemporary Jaguars. So much for automotive "borrowing" and "inspiration." Let's take a look at what's lurking behind that attractive new grille. As it turns out, the new styling is from the firewall front. The rest of the body is pretty much carryover — a good thing, because this is one handsome midsize luxury sedan. The substantive refresh also included interior tweaks, notably more user-friendly audio and climate controls and an optional new twin-turbo V-6, a Lincoln exclusive that can vault the MKZ from 0 to 60 in a tad over five seconds. The MKZ, a corporate cousin of the Ford Fusion, is Lincoln's least expensive sedan, with a relatively affordable base price of $35,170. You can run up the bill very easily — the panoramic sunroof is a $2,995 option, for example — but the car is nicely equipped in base form. It is also an exceptionally quiet automobile, with an excellent ride, reasonable athleticism, and a high degree of safety. It earned the government's top, five-star safety rating and the Insurance Institute for Highway Safety's Top Safety Pick+ ranking. 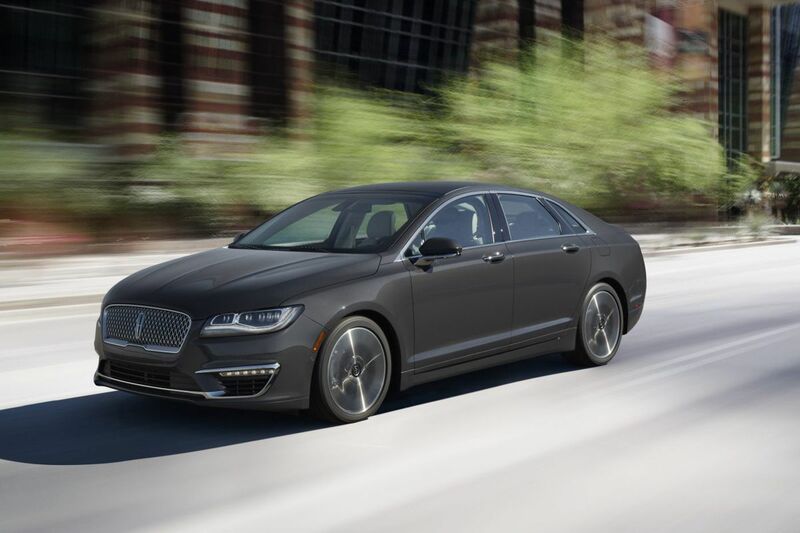 The test car, a Reserve model fitted with all-wheel-drive, was powered by the MKZ's standard engine, a direct-injected, two-liter turbo that develops 245 horsepower and a hefty 275 pounds/feet of torque. That engine gets this two-ton sedan from 0 to 60 a couple of seconds slower than the three-liter twin turbo V-6, but it gets it there more inexpensively. The V-6 tacks $2,750 on the price in the 350-horse form it takes in the front-drive MKZ, and $4,000 with the 400-horse variant used in the all-wheel-drive model. The tester was a looker, and didn't lower the aesthetic bar when you opened the door. The leather-trimmed interior, with its black-and-brown color scheme and satin metal accents, was knock-your-socks-off business. So was the original dash design. The properly bolstered, heated, and cooled power front seats were quite comfortable. The back seat wasn't as accommodating for someone a couple of inches over six feet. There was enough leg room, but my head grazed the headliner when I sat up straight. Cargo space was quite adequate for a vacationing family of four. The test car certainly handled and accelerated well enough, but its forte was on the highway, where its quietude, ride comfort, and solidity came to the fore. There were nearly $11,000 worth of nifty options on the tester, ranging from a wowser sound system to a heated steering wheel. But the one I would spring for was the cheapest date on the Monroney sticker: the inflatable seat belts at $195. They cushion the impact when you are thrown forward into the belt by a collision. Standard equipment: Two-liter engine; six-speed automatic transmission; all-wheel-drive; and a generously manned amenity army. Options: A nearly $11,000 gaggle of safety electronics and hedonism only hinted at in the Book of Much. Fuel economy: 20 city and 28 highway (regular gas).